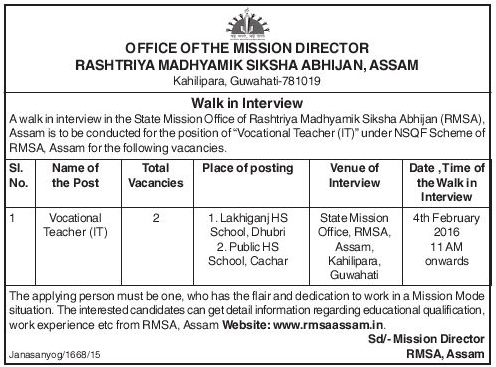 A walk in interview in the State Mission Office of Rashtriya Madhyamik Siksha Abhijan (RMSA), Assam is to be conducted for the position of “Vocational Teacher (IT)” under NSQF Scheme of RMSA, Assam for the following vacancies. The date of walk in interview is 4th February, 2016. Date, Time of the Walk in Interview: 4th February 2016, 11 AM onwards.